The most common degree programs for business finance or asset management are associate's and bachelor's degrees. In addition to general business classes, these programs offer a curriculum designed to prepare students to manage the assets and investments of an individual or organization. Specialty areas may include international finance, public finance, risk management and institutional investing. The field of business includes many different channels and specializations that can work together for a smooth running operation. Within this incredible career field, students may be able to find a specialization that can help to complement their interests as well as their skills. If you find yourself intrigued by the economy and the aspect of finance, the field of business finance may be a great option for you to pursue. This concentration option can be found at many diverse universities all over the country offering high-quality degree programs. The business finance degree program as a whole can be a great asset to students hoping to become a part of popular businesses in the U.S. These programs were designed to implement elements from accounting, financial strategy, purchasing and budgeting, making for a great combination of ideas for upcoming students. If you are a great problem-solver and hope to make a difference for companies seeking your services, this could be a great place to start. Read along in our guide below to hear more about what this program can help you achieve in your future. When you make the decision to enroll in business finance programs, you may be able to expect a large variety of finance-related courses throughout your degree program. Colleges all over the country can provide diverse and all-inclusive degree programs to help upcoming professionals learn about all of the finance-related topics relevant to the field of business. Since businesses can be so dependent on their financial management, this degree path may be popular for upcoming professionals with a desire to be an important part of companies worldwide. The degree programs available throughout the country can have diverse curricula. This can make it difficult to choose which program would be the most effective at teaching you the topics you need to know. You should always research the courses provided by each program in order to ensure that you are going to be learning about the most valid topics in business finance. The list below can assist you in knowing more about what to expect when searching through these programs. Our team of educational experts has pulled information from popular business finance programs in order to help you gain more information about these amazing degree programs. Business Analytics: This course was designed to give students a more objective outlook at the analytical tools available in business finance. The use of data in business decisions may be covered in this course, as well as modeling techniques for predicting the most likely outcomes of those decisions. The communication and delivery of analytical results may also be a large portion of what students can learn during this class. Applied Financial Management: Students enrolled in this course can learn more not only about the financial theories associated with management positions, but also the application of those theories in a real-world business environment. The use of spreadsheets for analytical purposes may be a portion of what is taught in this course, as well as the implementation of relevant case and company analyses for better management. Students may also take a look at some of the current issues and topics popular in the field of business finance. Mergers, Acquisitions and Restructuring: Financial professionals in the field of business should have skills that can assist during the acquisition or merging of different organizations. These types of changes may require extensive restructuring skills that include techniques regarding control, defense and diversification. Students enrolled in this course can learn how to effectively restructure their financial system in order to accommodate for larger needs. With a degree in business finance, you could find yourself having relevant information about the successful financial operations of businesses of various natures. This information can help you gain influential careers in some of the biggest companies in the country. Some professionals in this field may choose to work in organizations that provide products and services to the country, while others may choose to pursue businesses focusing on research or education. This type of career field can be especially diverse for people with an interest in different types of business ventures. The salary information below is reviewed and researched, so the data provided is from real people working throughout the United States. Take a look at the examples below. Financial Analyst: $84,300 on average per year (BLS). The job title you decide to pursue after finishing your degree may be very different depending on where you are employed. With these titles, your earning could also be very different depending on where you apply. Our team of experts has researched some real-world careers in order to provide you with a little insight into the earning capabilities of people with similar degrees. In order to be the best financial professional in the field of business, professionals must remain up to date on all of the latest trends in business. This can help bring a better understanding to the financial changes present within the field. This can involve staying current on stock market changes, demand and supply law. Finance specialists can assist companies with making profitable investments for their future. This can involved researching current investment opportunities and meeting with companies interested in gaining investors. Determining the profitability of these businesses and analyzing the strengths and weaknesses of each investment opportunity may be a part of this responsibility. Probably one of the most common job duties of business finance professionals is staying current on their company’s financial well-being. This can be achieved through examining financial records, spending and income accounts, which can tell professionals more about where a company currently stands in terms of financial wellness. This information can also help during the year’s planning processes for maximum profit improvement. It is relatively common for business professionals to meet concerning their prospective goals for the future. 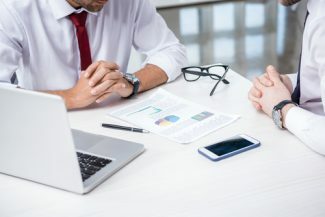 The financial professional can use these planning techniques to align financial spending and planning to what is desired. This can include working with business professionals in different sectors of the organization to ensure that purchases and budgeting are carried out as planned and maintaining current records on all financial transactions. Business finance professionals can present their work and research in many different forms. While some provide information vocally during meetings and conferences, others prefer to provide their information in graphic format. This can include the use of graphs or images, which can give non-finance professionals an easier outlook on what is defined throughout the presentation. Can a Master’s in Business Finance provide me with more opportunity than an undergraduate degree? : People choose to pursue master’s degrees for a lot of different reasons. One of the most popular reasons students give for pursuing these degrees is that so many students are graduating and pursuing careers at the bachelor’s level. While there are more factors to consider than just your degree level, having a master’s degree could definitely be your first step in qualifying for more advanced, in-demand career options in the field. Are there a variety of careers available with this degree? : Business finance programs can provide you with diverse skills relevant to business and finance. These types of skills can be increasingly important in the field of business, which could lead you into variable careers after graduation. Some professionals work in the analytical side of business finance, while others prefer management positions responsible for active planning and problem-solving within their field. What type of undergraduate degree do I need to be accepted into this program? : Most universities offering this degree can accept students from undergraduate disciplines such as business, finance, accounting and even mathematics. If your degree is not listed in these options, you should contact your school of choice to see about enrollment options. Most master’s programs can be enrolled in after completing a set of prerequisite courses regardless of your bachelor’s degree. The time it takes to complete a degree program is also an important deciding factor for new enrollees. While achieving a higher degree is a great accomplishment, most master’s learners are seeking a program that does not require an extensive amount of time. Some people at this degree level are currently employed in the field, making a long stay in a degree program unattractive. Below are a couple of example universities listed with the cost of tuition included. Take a look at these figures to see how different the costs can be at different universities. New students entering into degree programs may be overwhelmed with the amount of decisions needing to be made for their future. In the U.S., there is a tremendous amount of online degree programs featuring business finance topics available for enrollment. So, what do you look for in a potential degree program? Students should consider many important topics in their program, such as the reliability of the curriculum and school, the amount of money required to get started and the time it will take them to achieve their degree from start to finish. Most students can utilize financial aid/loans when enrolling in degree programs. However, more and more students are paying for their education out-of-pocket, to reduce debt accumulated from obtaining a higher degree. The cost of attendance for some universities can be listed by term or credit hour, so it is important to research these specific figures prior to choosing a certain school.